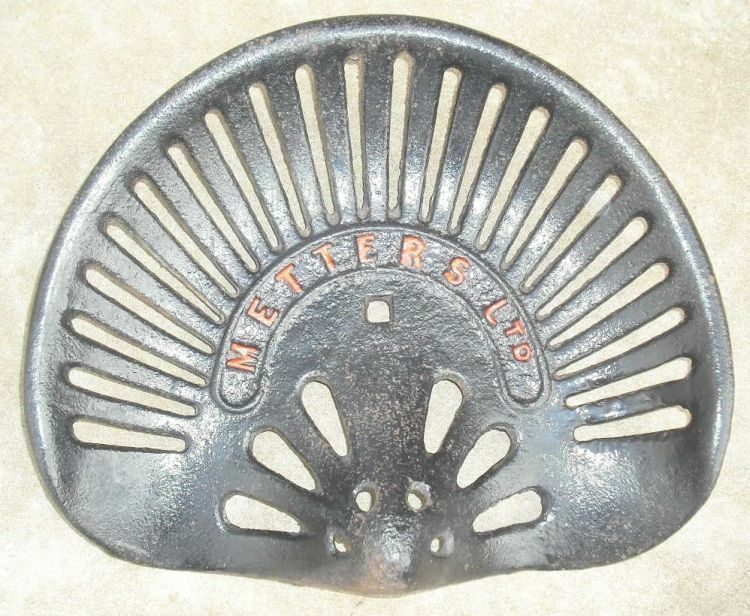 METTERS, FREDERICK (1858-1937), and SPRING, HENRY LANGDON (1864-1937), stove manufacturers, were business partners. Metters was born on 14 May 1858 in Melbourne, eighth child of James Metters, a Cornish-born bricklayer, and his wife Susan, née Flux, from the Isle of Wight. Fred probably worked for his father, who by 1869 was employed as a stove setter. After moving to Adelaide, on 8 October 1883 Fred married Frances Fisher at Clayton Congregational Church, Kensington. The family lived in Melbourne for some years in the 1880s. Back in Adelaide from 1890, next year he founded his stove-making company. Holding patents for cooking ovens, a firebox for ovens and a cooking apparatus—which won a prize at the Royal Agricultural and Horticultural Society's Show in 1899—he advertised himself as a 'Maker of Kitchen Ranges and Patent Improved Ovens' and a 'Coppersmith and Galvaniser'. To promote sales of his 'top-fire' fuel stove, he toured South Australia, demonstrating it at country shows. In 1894 he opened a branch in Perth where, at 68 Hay Street, he obtained premises being leased to Henry Spring. Henry had been born on 25 September 1864 at Hackney, London, son of Henry Spring, merchant's clerk, later insurance broker, and his wife Marion, née Ballment. After working for ten years in a stockbroker's office in London, Spring sailed for South Africa and at the age of 25 joined the British South African Police. His health affected by malaria, about 1892 he migrated to Victoria, where he ran a country store and a travelling caravan. He then moved to Western Australia and operated a carrying business between Perth and Fremantle. On 6 November 1895 in St George's Cathedral, Perth, he married with Anglican rites Ellen Orianna Daw, from Adelaide. The previous year Spring had started as a clerk in Metters & Co. He quickly became its driving force and in 1898 was made a partner. After Metters sold his interest to Spring in 1907, Metters Ltd was formed in Adelaide with Spring as managing director. The nominal capital of the company in 1911 was £200,000. Spring's younger brother Robert Alexander (1873-1971), born at Woodford, Essex, had reached Perth in 1897 and was assistant to the manager of the factory there. In 1902 he established a Metters foundry in Sydney, and was its first manager. On 29 August next year, at St Philip's Church of England, he married Ellen's sister Josephine Constance Daw. The firm advertised (1909) as 'stove and range makers, ironfounders, engineers, coppersmiths, sheetmetal workers' and undertook to provide windmills, pumps, troughing and irrigation requirements. A new, illustrated catalogue (c.1910) showed ornamental castings, ventilating friezes, crestings, finials, verandah drops and memorial tablets. In 1911 new or rebuilt factories on larger blocks of land appeared in Adelaide and at Subiaco, Perth, and in 1913 new premises were erected in Elizabeth Street, Sydney. Henry Spring oversaw an expansion as the company produced gas and fuel stoves, other domestic appliances and agricultural machinery, including water tanks. During World War I large quantities of cooking equipment were provided for the armed services. In 1918 Metters Ltd bought the business of R. Foreman & Sons, Hobart, makers of porcelain-enamelled baths, the manufacture of which was brought to Sydney. Capital in the company increased again in 1924 to £1,000,000. When a controlling interest was acquired in Porcelain Enamellers, New Zealand, Metters (N.Z.) Ltd was formed in 1926. Three former employees of Metters Ltd had begun the K.F.B. Foundry in Sydney in 1916; competition became keen and in 1927 the two businesses amalgamated, each keeping its old trade identity while a holding company, General Industries Ltd, was formed. Henry Spring became the chairman of directors of the holding company, while retaining control of Metters Ltd. Soon a factory was built at Footscray, Melbourne. Henry was a councillor for many years of the Metal Trades Employers' Association and had pastoral interests in Western Australia; he was said to have been among the first to introduce motor transport of cattle and sheep. Living at Mosman, Sydney, he was interested in motorcars and motorboats and was a founder of Mosman Golf Club. He died on 21 April 1937 in St Luke's Hospital, Elizabeth Bay, and was cremated, survived by his wife, three sons and one daughter. His estate was sworn for probate at £17,698. Metters lived comfortably in a grand house at Rose Park, South Australia, from 1911 to 1922; thereafter he lived with his sons at Waikerie and Gumeracha. He was a tall, solid, full-faced man, broad-minded and determined, who neither smoked nor played any sport and did not attend church. Predeceased by his wife, he died intestate on 25 September 1937 in Ru Rua private hospital, North Adelaide, and was buried in West Terrace cemetery. His three sons and three daughters survived him. He had already divided his assets among his sons, none of whom entered the business. Robert Spring, a plump, cheerful man with a jocund smile, became managing director of Metters Ltd after his brother's death. In World War II the firm produced land mines and pontoon bridges. Plagued by strikes, in 1952 Spring announced a pact with 1300 workers at the big factory at Alexandria, Sydney, which he hoped would end labour disputes. He retired from the company in 1956. Robert was a life member of the Royal Zoological Society and a member of the Metal Trades Employers' Federation. Predeceased by his wife, he died in his home at Clifton Gardens, on 15 April 1971 and was buried in Northern Suburbs cemetery. Two sons and a daughter survived him. In 1974 Email Ltd purchased the company. Perhaps the best remembered of all Metters products was the two-coloured (cream and green), enamel 'Early Kooka' stove—featuring a kookaburra with a captured worm—which was first made in 1937, the year in which both Fred Metters and Henry Spring had died. The Story of Metters (1965); Daily Telegraph (Sydney), 25 Sept 1922, p 3; Sydney Morning Herald, 9 July 1927, p 17, 22 Apr 1937, p 17, 2 Mar 1952, p 2, 20 Apr 1971, p 14; National Times, 24-30 Oct 1982, p 15; private information. Print Publication Details: Joyce Gibberd, 'Metters, Frederick (Fred) (1858 - 1937)', Australian Dictionary of Biography, Supplementary Volume, Melbourne University Press, 2005, pp 277-278. .
Spanners marked "METTERS" are the only ones found to date - quite uncommon, simple flat plate spanners. Metters Flat Plate spanner, only type and size seen to date.